Preheat oven to 350°F. 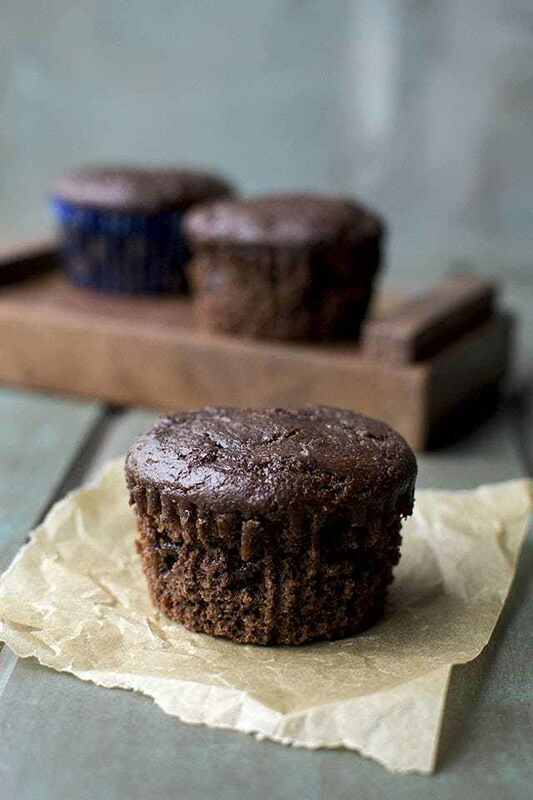 Line 16 muffin pans with paper liners or spray with nonstick spray. I used 12 cup muffin pan and a small loaf pan. In a large mixing bowl, whisk together flour, sugar, baking powder, salt and cocoa powder. In another smaller mixing bowl, combine ricotta, egg replacer mixture (or eggs), milk, vanilla and oil. Whisk until the mixture is smooth. Add the ricotta mixture to the flour mixture and stir just until combined. Fold in the chocolate chips. Try not to over mix the batter. Divide the batter evenly in the muffin cups. Bake for 20~24 minutes or until a cake tester inserted into the center comes out clean. Remove from the oven and let cool in the pan for 5 minutes. Remove from the pan and place on the wire rack to cool completely. Store in an airtight container for 2~3 days or freeze for longer storage.